On a recent cruise to Mexico, I played this game while waiting for a spot to open at one of the blackjack tables. I should’ve never gone near this machine. It took my soul. The quick premise: a bunch of bundled wads of a hundred ones and a three pronged crane. For one dollar, you receive one try to wrap the crane around one of the wads of cash and return it to the drop zone. While waiting for another showdown with that snake in the grass black jack dealer, Godwin from Zimbabwe, I tried Cash Crane for the first time. Fool’s gold, I secured one of the bundles with the crane and everyone in the casino began to shout. The crane was maybe four inches away from the drop zone when the bundle came loose and clanged off the side of it. Everyone lost their minds as though I just missed the game winning jump shot in game seven of the NBA finals. A group of people shouted “Feed the machine”. Another group chimed in, “Everyone wins at Cash Crane”. After that, I was hooked for the entire week and the truth is, no one wins at Cash Crane. It is a one in a thousand chance. Kind of like the odds of selecting a productive player in the 2013 NBA draft. So who won the NBA’s latest version of Cash Crane and came out with this year’s rookie of the year? After Michael Carter-Williams’ most recent stretch of outstanding play, it seems obvious to me that the Sixers had the magic touch (no pun intended) and ousted Orlando for that mythical bundle of one hundred dollars. Over his last five games, MCW has established himself as a level above Victor Oladipo and locked up the Rookie of the Year. But for those of you MCW detractors out there, I will explain why Carter-Williams will win the award. We will get back to the ins and outs of Cash Crane later. Before we examine the evidence, we need to go through a direct stats comparison between the two candidates. Oladipo’s season averages: 14 PPG, 4.3 RPG, 4.2 APG; 3.2 TOV; 1.6 steals per game; 41.4 FG%, 31.3 3P%, 41.3 eFG% and a 51.4 TS%. MCW’s season averages: 16.5 PPG, 6.1 RPG and 6.3 APG; 3.6 TOs; 1.9 steals per game; 39.3 FG%, 25.9 3P%, 42.5 eFG% and 47.2 TS%. The obvious take away is that Carter-Williams averages 2.5 more points, 1.8 more rebounds and 2.1 more assists per game. Don’t feel bad Oladipo, Carter-Williams leads all rookies in those three major categories. However there are some arguments as to why Oladipo should win the award over Carter-Williams. Many NBA pundits as well as fans will say is that Carter-Williams plays for an abysmal 17-60 team so his stats should be taken with a grain of salt. Oladipo’s Orlando Magic is only 21-54 so the games he plays in are just as meaningful (or meaningless) as MCW’s. Other MCW doubters will point out the the fact that the Sixers lead the League in pace which gives Carter-Williams a lot more possessions than Oladipo. The Oladipo fan club will also wanted noted for the record that Carter-Williams hauls more minutes per night (35 vs. 31) and owns a higher Usage Percentage (26% vs. 24%), while Oladipo has a slight edge in a few advanced metrics. These points all have merit and probably gain the most traction for the Oladipo campaign. Still, these items aren’t compelling enough to place the 2014 ROY hardware on Oladipo’s mantle. Many debates have taken place on whether the NBA MVP award is for the most valuable player, or the best player. The consensus is that it is for the most valuable player and this stance is applied to the rookie of the year award as well. Just think where this 76ers team would be without Carter-Williams. As depressing as it may sound, the Sixers would be the worst team of all time without their star rookie. Does Oladipo have the same kind of value for the Orlando Magic? Absolutely not. Oladipo doesn’t not lead the Magic in a single offensive statistical catgeory. In fact, assists per game is the only category Oladipo ranks in the top four for Orlando (2nd). He doesn’t do the majority of the ball handling for the current Magic squad and ceratinly isn’t responsible for directing a glorified D-League team out on the court. However, both of those responsibilities for the Sixers fall on the wiry shoulders of Carter Williams. Then there is the argument that Oladipo is playing so well as of late that he has caught Carter-Williams in the race for the ROY award. Let’s take a look. In Oladipo’s last ten games he is averaging 14.9 PPG, 5.2 APG and 3.9 rebounds per game. Well for Carter-Williams last ten contests he is averaging 15.3 PPG, 8.7 RPG and 6.5 assists per game. Let’s go a little deeper. In February Oladipo had averages of 14.7 PPG, 4.4 RPG, 4.9 AST and a 41.4 FG%. In March Oladipo was actually slightly worse with 14 PPG, 4.4 RPG, 3.4 APG and a 42.1 FG%. The problem was Oladipo went down 1.5 assists per game while increasing his turnover output from 2.8 to 3.7. Carter-Williams had a significant dip in play in February with averages of 16.7 PPG, 4.3 RPG, 4.7 APG and a 38.4 FG%. Carter-Willams also accumulated 4.6 turnovers per game. This gave him a very below average 1-1 assist to turnover ratio for the month. 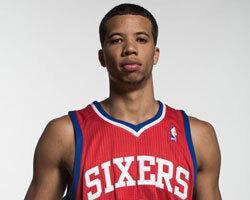 In March Carter-Williams became much more well-rounded with averages of 14.9 PPG, 8.4 RPG, 6.5 APG and a 37.2 FG%. Carter-Williams went from 4.7 APG-4.6 TO to 6.5 APG-4 TO. That’s a good way to get back on track with a fifty percent increase in his assist-turnover ratio. More impressively, Carter-Williams had seven double digit rebounding or assist games in March to go along with four games with 20 points or more. Compare this to Oladipo’s single game with more than ten rebounds or assists and one game with over twenty points in March. Yes, Oladipo’s stats in the last two months are impressive but are they enough to eclipse Carter-Williams for the top rookie spot? Again, I don’t think so, especially given the surge in MCW’s play over his last five games — 19 ppg. ; 6.6 apg. ; 6.8 rpg. ; 51% on FGAs and only 1.8 turnovers per night. So at this point the only solid arguments for Oladipo are opinions based “What if?” scenarios. As in, maybe if Oladipo had more opportunities then his stats would be better. This argument is a “He said, she said” argument that no one will ever win. If Oladipo played forteh Sixers then his stats would be better. Well, if Carter-Williams played for the Magic maybe his stats would be much more efficient. You see where I am going with this. In a recent interview with the Orlando Sentinel, Oladipo opened up,”If they give me Rookie of the Year, it’s a good thing, but, at the end of the day, I want to be great. So whether I get it or not, I’m just going to go out and continue to keep getting better.” I had the same attitude as Oladipo except for the fact that it pertained to Cash Crane instead of rookie of the year. Hey, at least he will have some good bulletin board material after he loses out on the rookie of the year award. Carter-Williams has earned this award for his play throughout this season and the gap is now too big to be made up. Statistically MCW may not be better than Oladipo in every category, but he has the edge in a number of key columns. As for the eye ball test perspective — it’s not even close. As Godwin the blackjack dealer from Zimbabwe would say, “Twenty-one”. This contest is a wrap. Alex Gorge is a scribe for Philadunkia. You can follow him on Twitter @apg3000.